"On Sept. 3, 1954, 5,000 shells descended on Quemoy. MAAG Taiwan Lt. Cols. Frank Lynn and Alfred Medendorp were among the dead that day. The shelling grew heavier; during the campaign, an average of 10,000 Red rounds were fired daily. 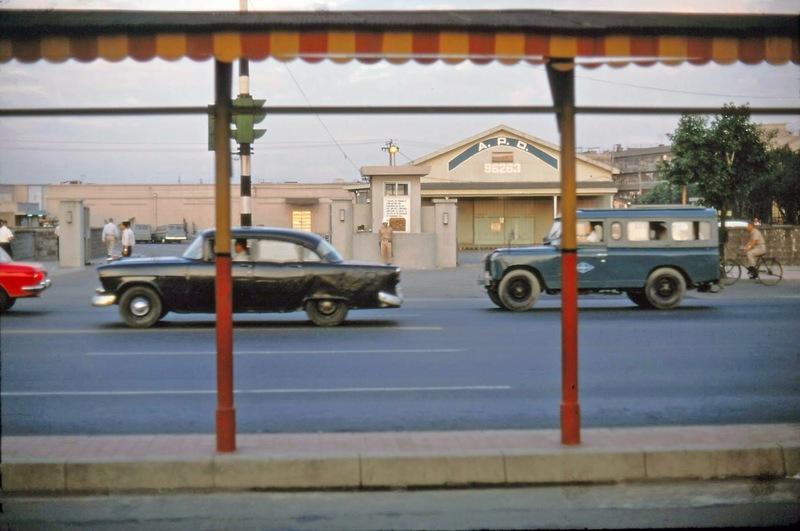 Part of a article from "The Cold War in Asia" by Michael Haydock, from the VFW Magazine. 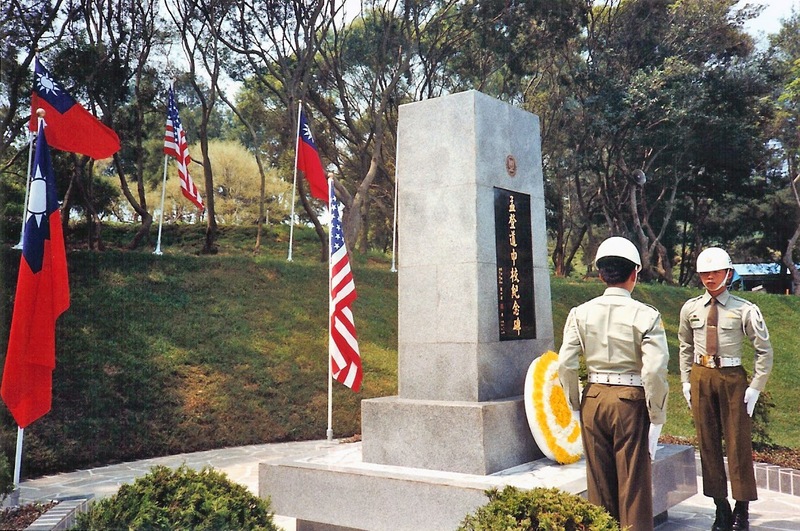 This week, the Kinmen Defense Command unveiled a monument recognizing LTC Frank Lynn who perished on September 3, 1954, while under shelling attack from China. You can read about the ceremony in today's Taipei Times Newspaper HERE . 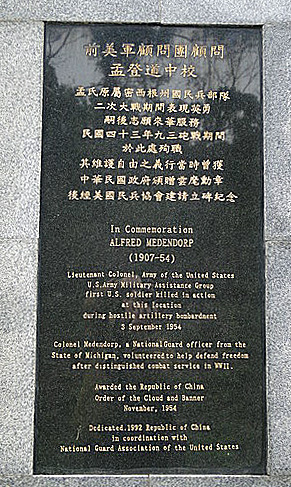 In 1992, a plaque was unveiled in honor of LTC Alfred Medendorp. The Medenhorp family was transported to the very spot where LTC Medendorp was killed. There, they witnessed the dedication of a monument erected in his honor. 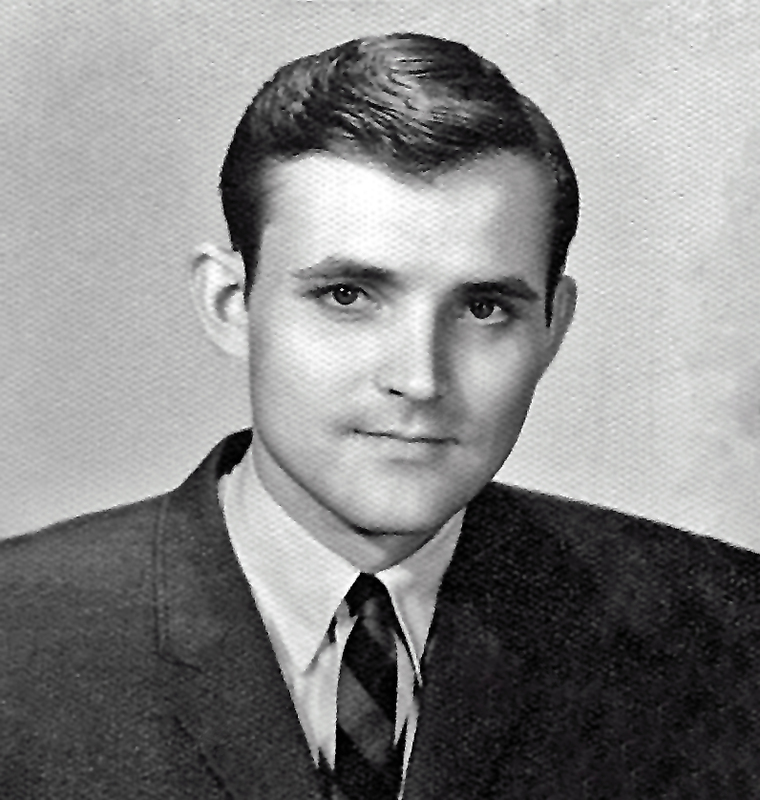 US military Lt. Col. Alfred Medendorp, a former member of the U. S. Army Military Assistance Group was killed in combat at the Kinmen Shuitou Wharf during the Artillery Bombardment of September 3rd (September 1954). He died in action under the fire of the Communist China’s artillery. He was 47 years old (1907-1954). In the fall of 1954, on the eve of the Southeast Asia Convention, Communist China attempt to exert pressure over the nations attending the convention to influence the agenda of the convention. Driven by a desire to pound the Kinmen area in a surprise offensive, China bombarded a navy vessel docked at Shuitou Wharf to strengthen its international clout, thus bringing to reality its political blackmail scheme. Since Communist China dared not launch a direct offensive, it resorted to the violent bombardment of Kinmen. September 3, 3:00 p.m. Communist Chinese artillery began pounding the islands of Kinmen (Greater Quemoy and Lesser Quemoy), and sending surprise attacks on Shuitou Wharf. Kinmen Defense Commander Gen. Liu Yu-Chang immediately ordered the artillery troops to launch counter strikes to suppress the Chinese attacks. Communist China pounded Kinmen for two straight hours that day, and continued to launch fragment cannon attacks until 8 in the evening. 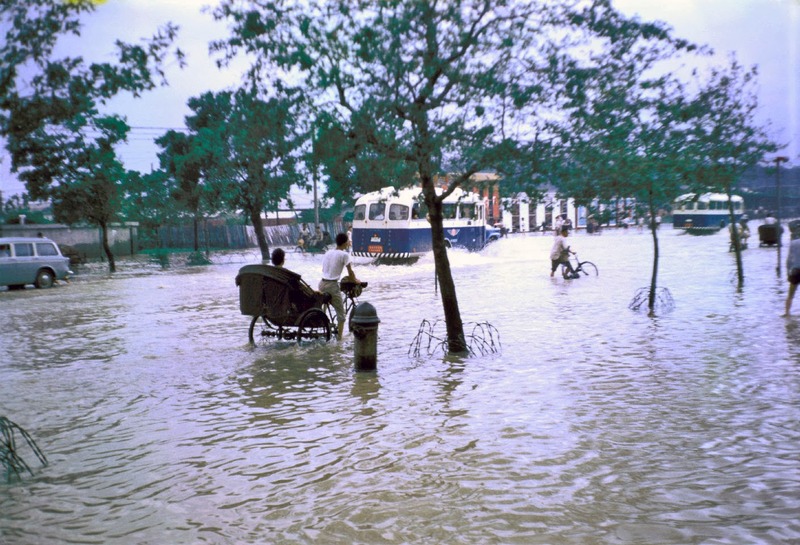 None of the villages along the coasts of the Kinmen Islands had been spared. The military accounted over 5,000 rounds had been fired to Kinmen. The offensive was a prologue of the cross-strait artillery battles between Communist China and Taiwan. (Artillery Bombardment of September 3rd) In the fifteen-day period that followed September 3rd, Communist Chinese fired 8,767 cannon rounds towards the Kinmen area. The attacks damaged the Shuitou Wharf and several civilian housings, as well as killed over 10 military personnel; Lt. Col. Alfred Medendorp of the United States Military was among those killed in action. The heroic fighting spirit of the front defense line awed the Communist Chinese troops and earned the respect and admiration of the ROC and foreign nationals. In memory of the unselfish and heroic sacrifice of Lt. Col. Medendorp, the R.O.C. Government issued a “Cloud and Banner Medal” of honor award to him. In 1992, upon the request of the National Guard Association of the United States, the government erected a monument at the spot where Lt. Col. Medendorp was killed. The monument was designed and constructed under the supervision of the contemporary Lieh-Yu Division Commander - Army Major General Kao Hua-Chu and the incumbent Chairman of the Veterans Affairs Commission. 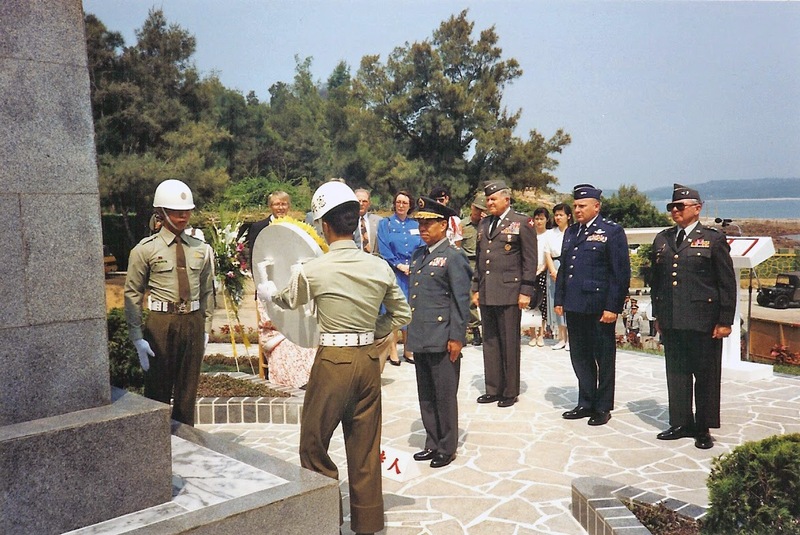 Following the completion of the stone, the Chief of the General Staff, General First Class Liu Ho-Chien inscribed the memorial epitaph. The stone (Lt. Col. Alfred Medendorp monument) was erected on August 7, 1992. 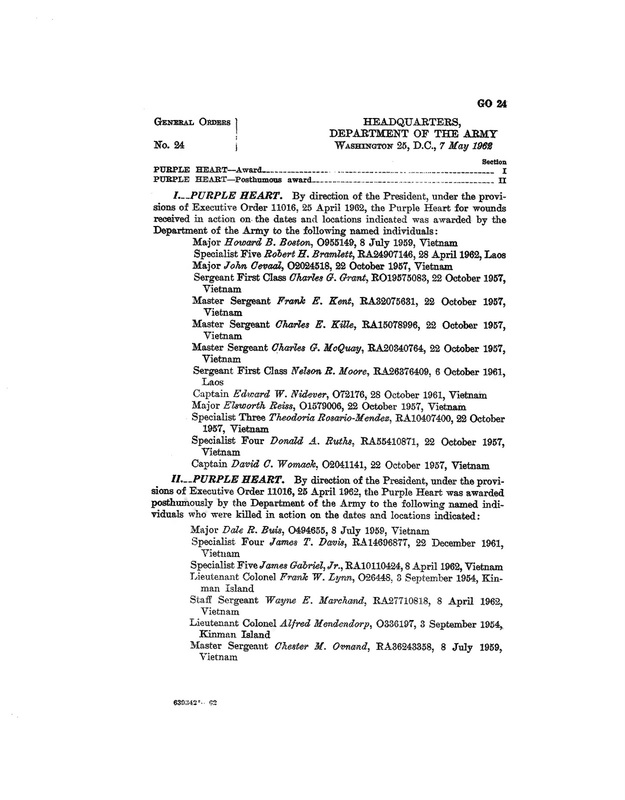 After distinguished combat service in WWII. I am not aware of the reasoning behind why both soldiers were not honored together in 1992. According to the New York Times newspaper, " Friday's [Sept. 3] Communist shelling of Quemoy where two U.S. Army officers were killed when the shelter in which they took refuge was hit." I would suggest one was a combat arms officer and one was a physician. Could it have been one of those turf things? No matter, they both were honored, which is an honor in itself. 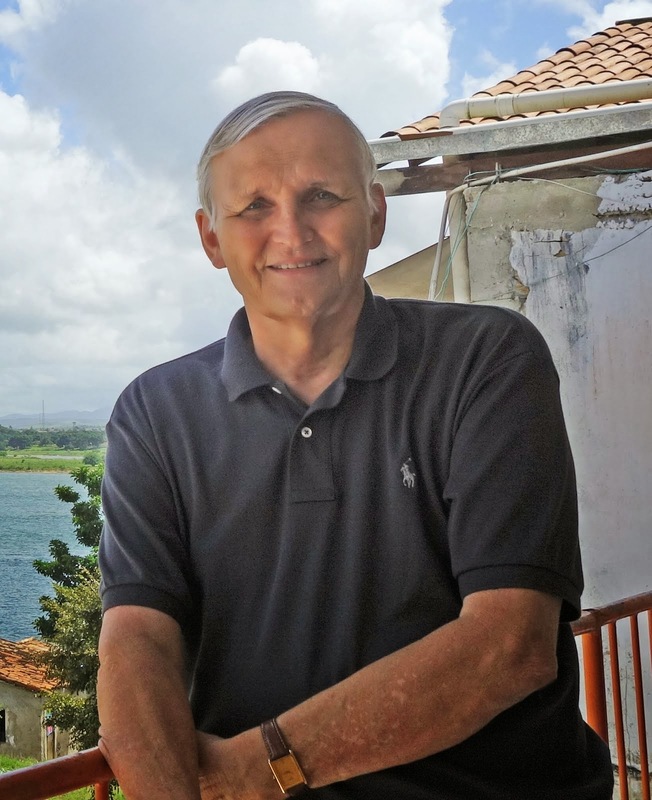 "I’m a Vietnam researcher working a project – and by coincidence you did an article about 2 Officers killed at the station back in 1954 that intertwined with my project. Thought you might find this interesting. In July 1954, a group of Viet Cong attacked a MAAG Advisory team just outside of Saigon – killing two and wounding a third American. The incident is historical in that these two soldiers were the first US casualties of the war. While documenting this incident, I noticed that the Army had coded the death of one of them – Major Dale Buis – as ‘Accidental’….most likely to keep the attack out of the press at the time. That coding would have prevented him from being awarded a posthumous Purple Heart. However – after further research – I found that in 1954 DoD had no authorization to award a PH to anyone worldwide, regardless of the situation. It wasn’t until April/1962 that Pres Kennedy signed Executive Order 11016 – allowing the medal to be awarded retroactively. Within days, the Army issued General Order #24 (attached) – issuing the 3 soldiers in the incident…along with 2 from Kinman Island. Ironically, I had started to look into this in mid-Dec/2011 – and when I did a search on your 2 to see what was going on – it quickly brought me to your article. Quite fortuitous." Below, the General Order awarding the Purple Heart to both officers. Their names are in Section II. which contains the names of individuals awarded the metal posthumously. Click on the General Orders below, they will open in a larger size for easy reading. 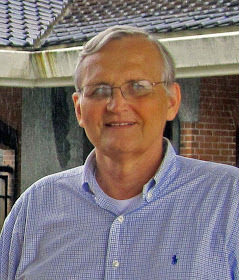 I received note from David Medendorp, son of LTC Medendorp, who was killed during a Chinese Shelling of Quemoy on September 3, 1954, while on-duty with US MAAG Taiwan. David included two photographs of the 1992 ceremony dedicating a monument located at the site where LTC Medendorp and LTC Flynn were killed 1954. Thank you to David Medendorp for sharing these photographs. 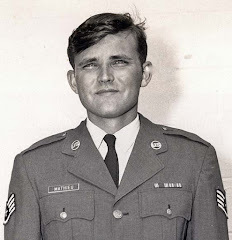 "An interesting event that occurred in the spring of 1962 while I was serving there. President Chiang Kai-shek began to mobilize his military forces for one last effort before his death, to retake the mainland. Between his military leaders and the American command, his invasion plans were never allowed to take place. However, for about three months all his military, including all American forces on the island, were in full readiness for an attack. We can only speculate on what the outcome would have been had he been allowed to proceed." 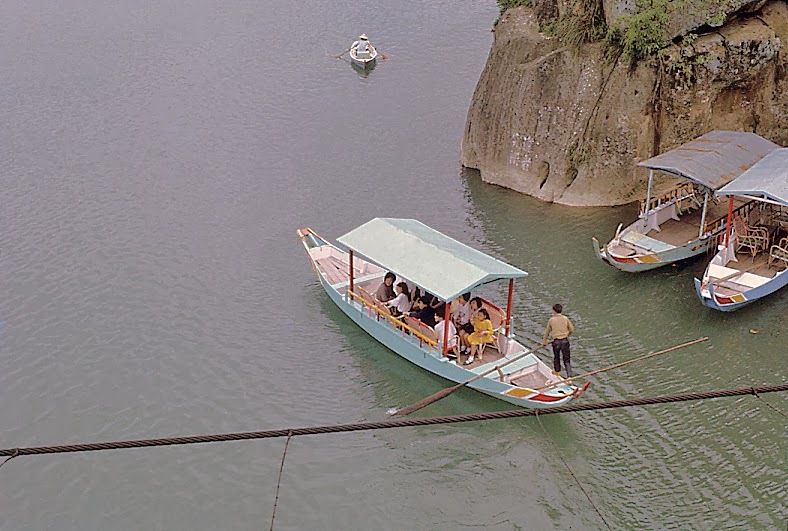 The Chinese characters on the wall announce deep water area. This large stone outcropping is the top of the stone that warns of deep water. A family out for a day of fun on Green Lake. The photos above were all taken from this bridge. Refurbished and updated, the bridge is still in use today. Move back and forth between the 2 photos above. Lots of changes in 45 years! 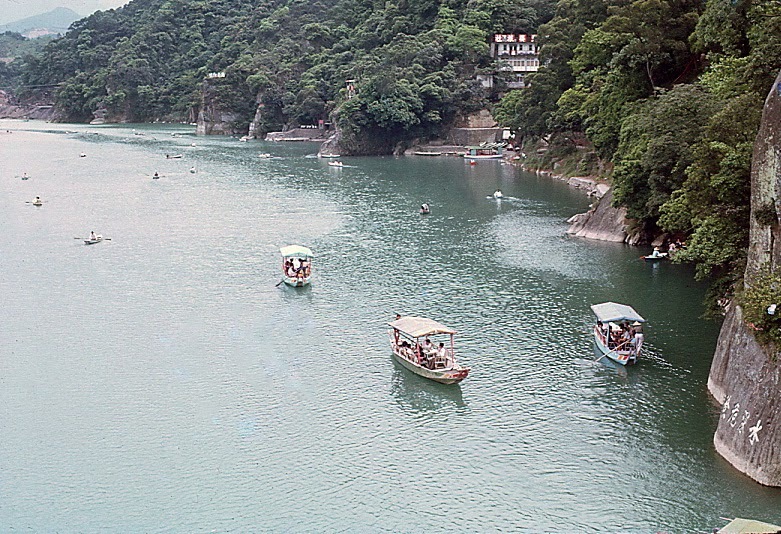 Another photo taken from the bridge, looking upriver in the 1960s. Lots more color photos from John soon. 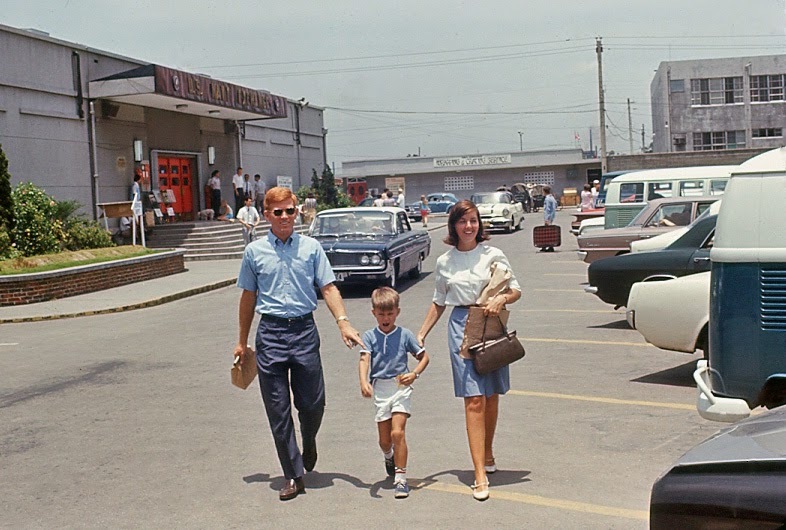 Today, more photographs from Jack Hornbeck,Taipei Air Station, 1966-1969. Jack's previous photos were featured - HERE. 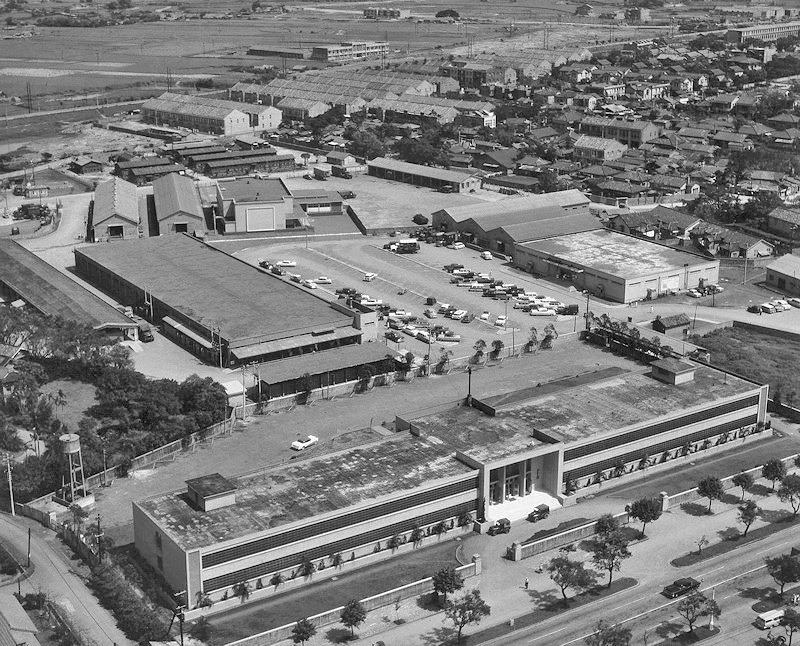 This aerial photo of the HSA East Compound, taken in the late 1950s or very early 1960s, provides a nice clear view of the area. The Navy Exchange, the square building toward the center right of the photo, building 802 on the map below. 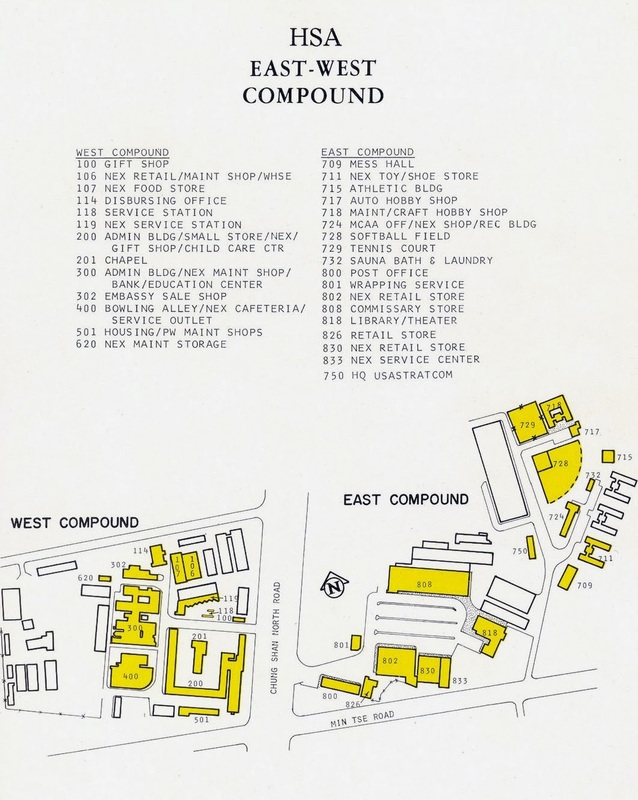 The Navy Commissary Store, the long rectangle building to the left center of the photo, building 808 on the map below. This map was published many years after the aerial view photo above. 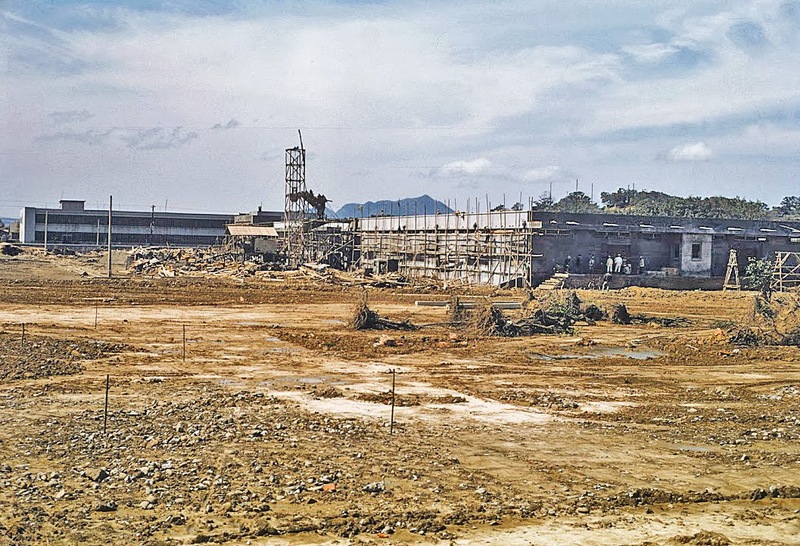 A lot of construction took place after the photo was taken. 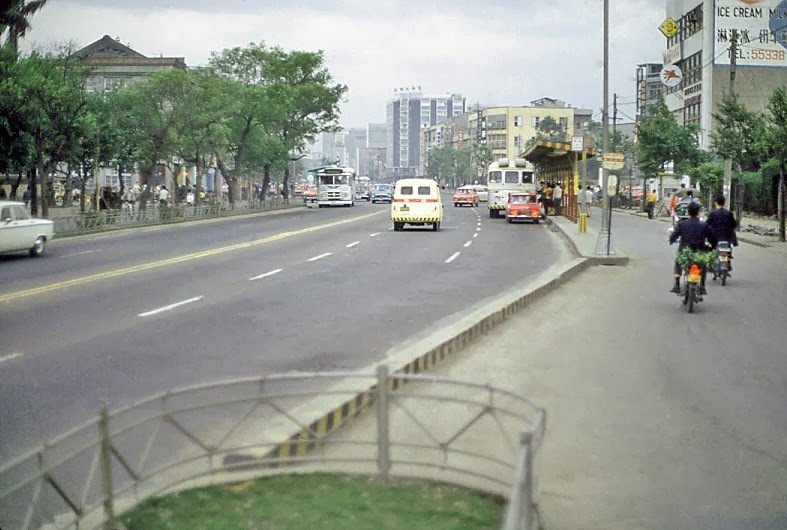 Min Tse (East) Road, which is seen on the bottom of the map above, was not completed and opened until the late 1960s. 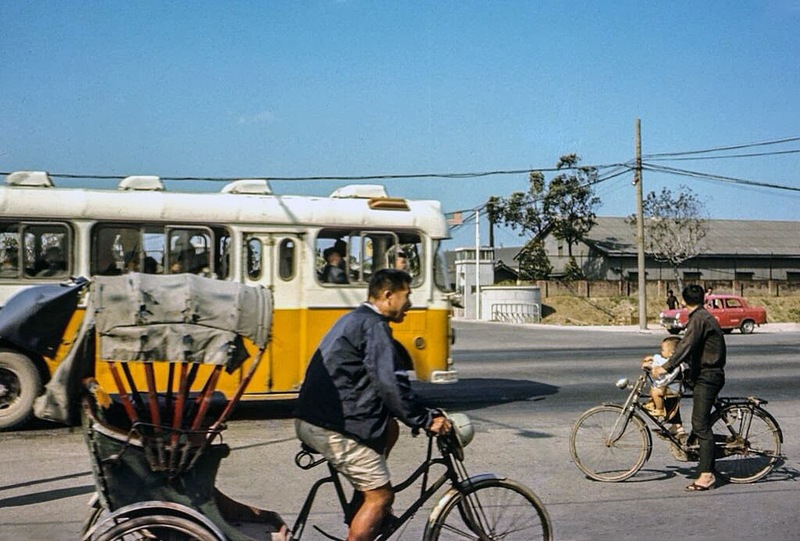 Let's cross the street (Chung Shan North Road) and walk into the compound. APO 96263, straight ahead, inside the gate. 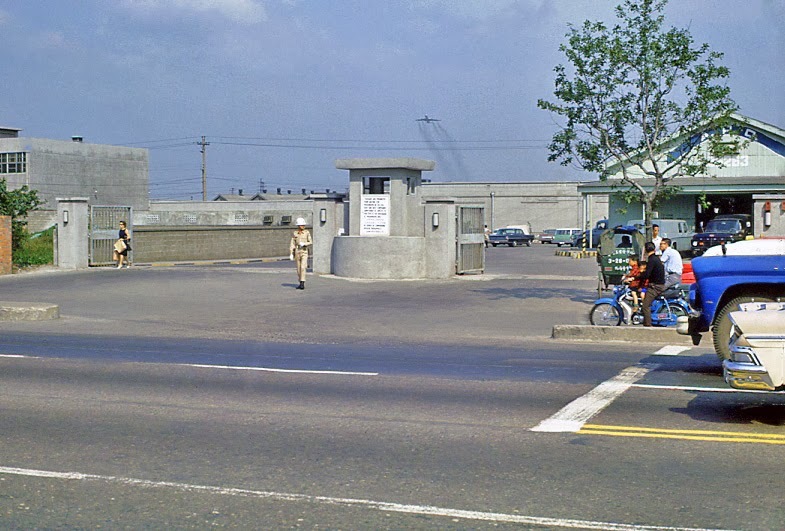 Remember how the Taiwan Military Police would just wave you inside the gate. I saw some remarks from an American civilian not employed by the US in any capicity, saying he would sneak into the West Compound and have a nice meal at the Navy Cafeteria (building 400) once or twice a month, He missed his American food. He was never asked for an ID, always walked in along-side some American. Looking for a traffic light, don't see one. Looks like there was a light, who remembers? Notice the civilian airliner taking-off from Sung Shan International Airport. 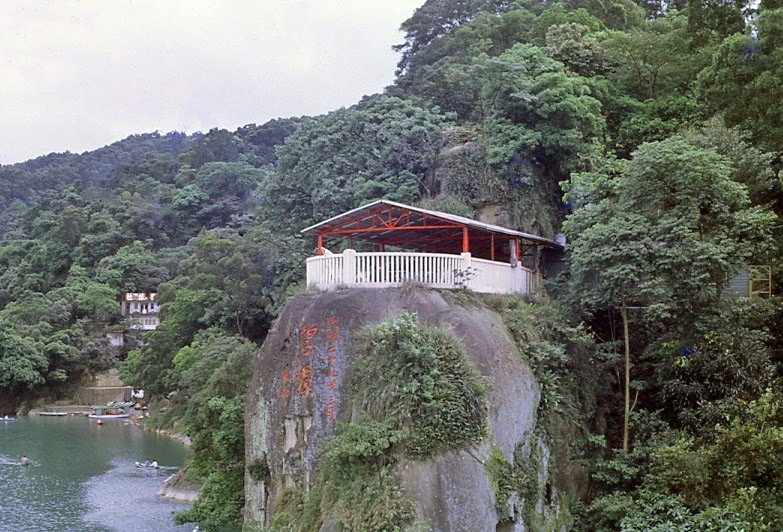 He'll probably climb-up right over the Taiwan Government Military Hostel, (the gray building) seen in the left of this photo. Many US Military stayed in this hostel one time or another during their tours. 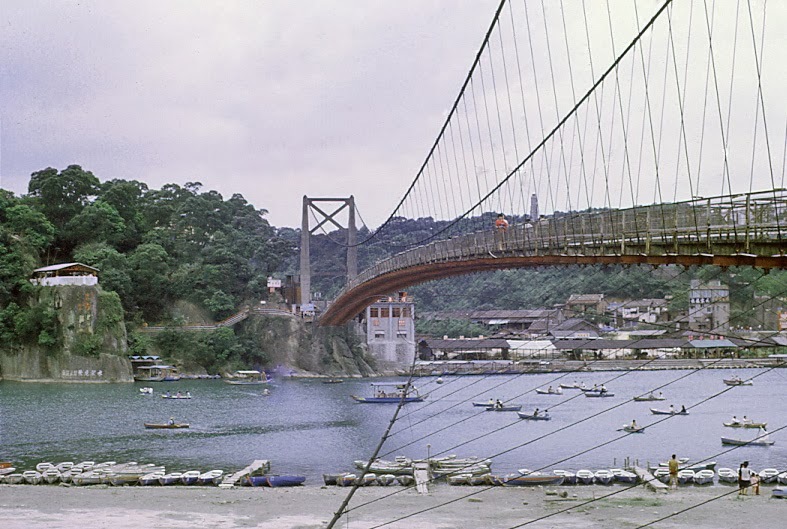 Navy Commissary Store Taipei under construction 1957. Many parking stalls available today. Maybe the Commissary Store is closed for inventory or something. 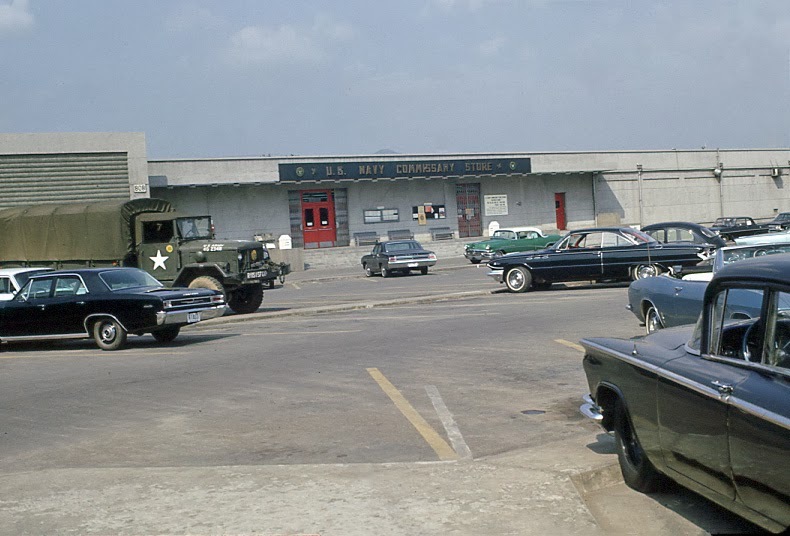 Remember, years ago, the Commissary Store closed a couple of days each week for one reason or another. You've heard the stories, supplier of goods to the US Military community, and foreign embassy communities, not counting the local community who purchased everything legally obtainable, including a host of items not authorized to be sold to the local economy. 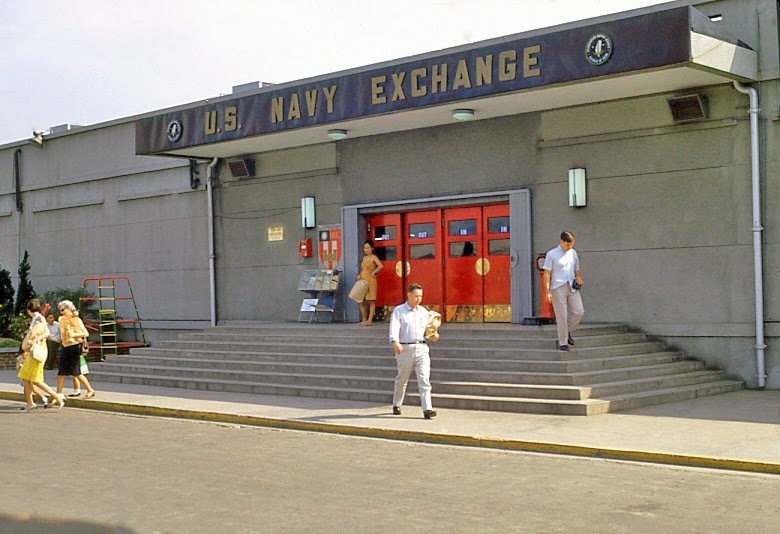 This photo is probably one of the best color photos of the Taipei Navy Exchange that's ever been published. 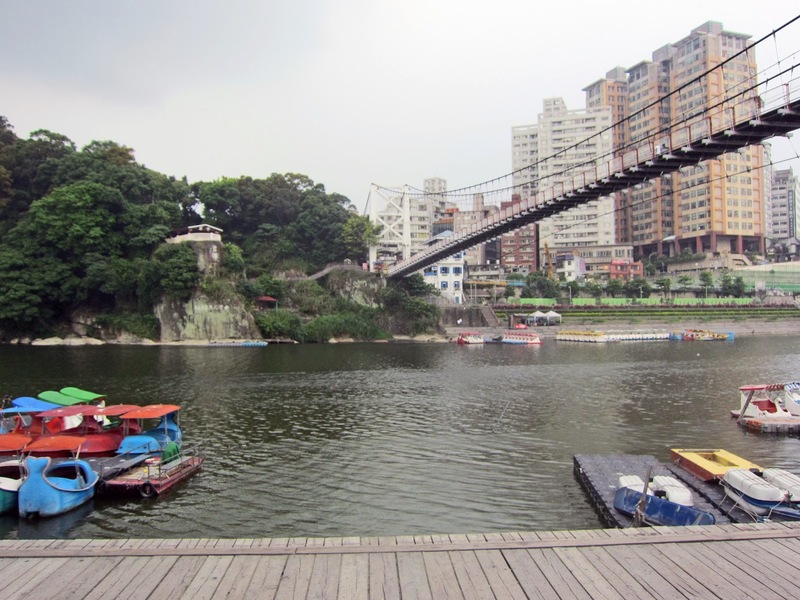 A nice sunny day in Taipei. Shopping over, heading for the car. Can someone make out the sign on that shop straight ahead. It was a pack and crate shop once, a small mini-mart at one time. What was it the day this photo was taken? We're back outside the East Compound Gate, looking across the street toward the West Compound Gate. Lot's of traffic blocking our view. Here's a great photo the HSA West Compound Gate. Nice blue Chevy across the street. 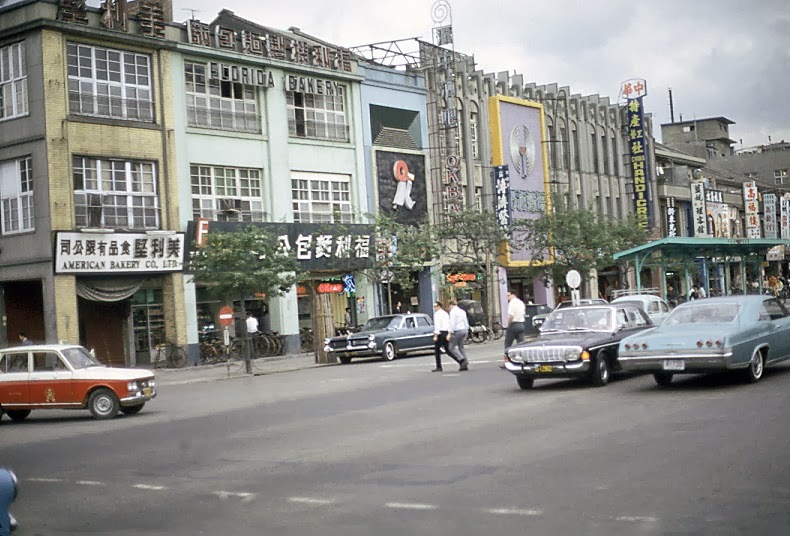 Photo courtesy of Donald Patrick, taken while in Taipei on R&R in 1967. We're walking south on Chung Shan North Road. Everyone remembers the shops on the east side of street which are seen here. 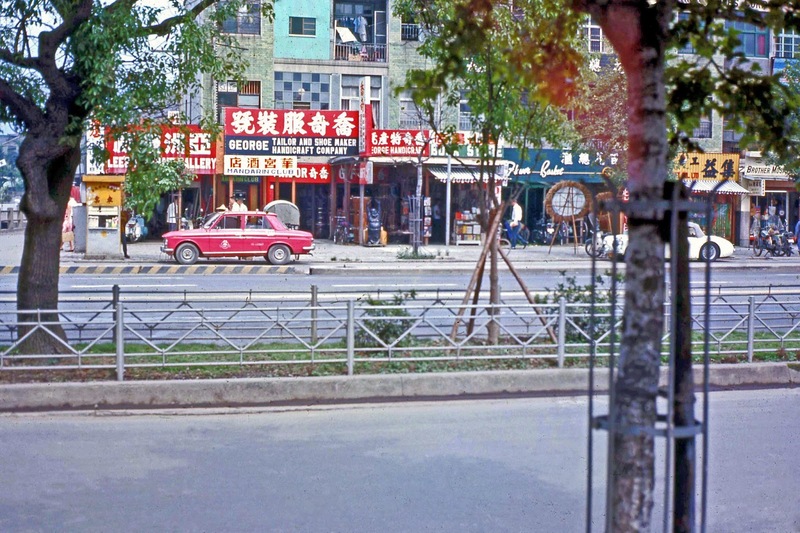 The Linkou Club and Hotel were across the street and down the walkway seen just behind the tree on the left side of this photo. 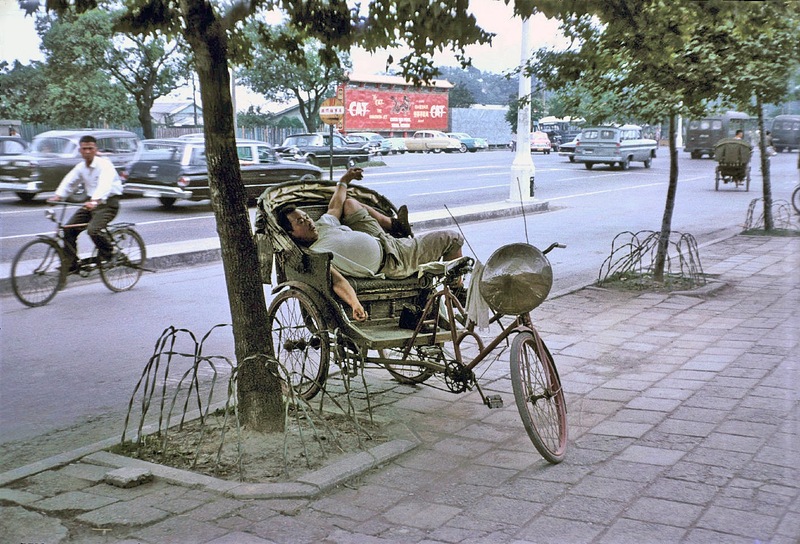 Nap time in the cool shade along Chung Shan North Road just down the street from the HSA Compounds. 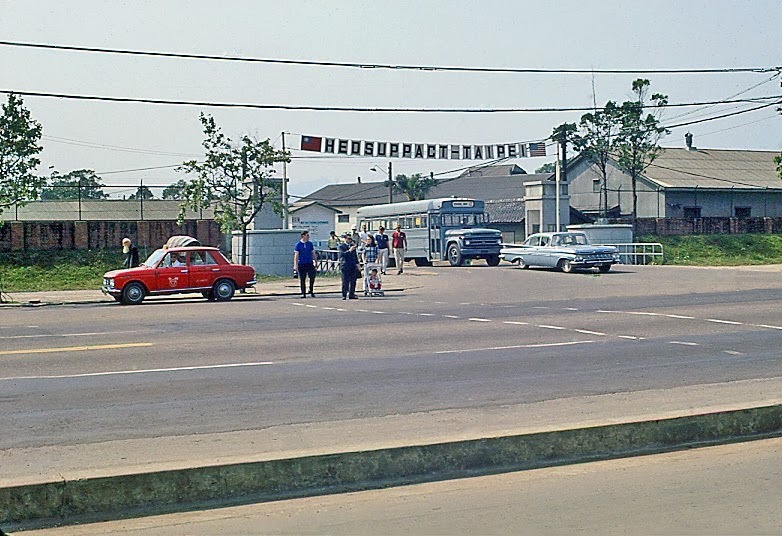 Notice the CAT Airline Advertising signage along the far side of the road. Ben returned to Chung Shan North Road after a typhoon blew through. Looks like about half of the CAT sign was blown away. We're on the west side of Chung Shan North Road, looking south. On the next corner, straight ahead, to the left is the Florida Bakery. On the right ahead is the gas station. 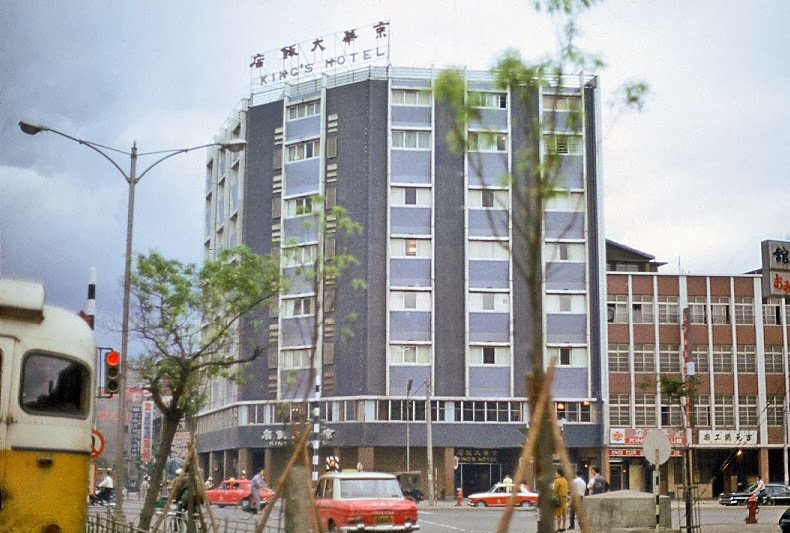 Looking off into the haze ahead, on the corner on Min Quan is the King's Hotel, a well known establishment. Here's the next cross street. To the left, the Florida Bakery, AND, the American Bakery Company. If you look closely, it appears that the American Bakery is closed and the windows have been removed. How many readers remember the American Bakery? I didn't remember it, can't say I even knew it existed. 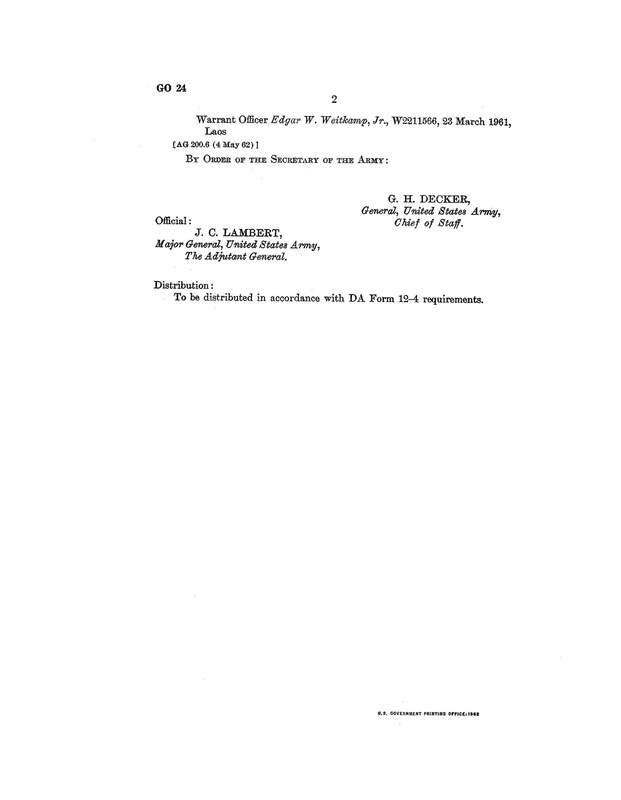 Here is an interesting piece of history. From the "History of the US Air Force in Taiwan." 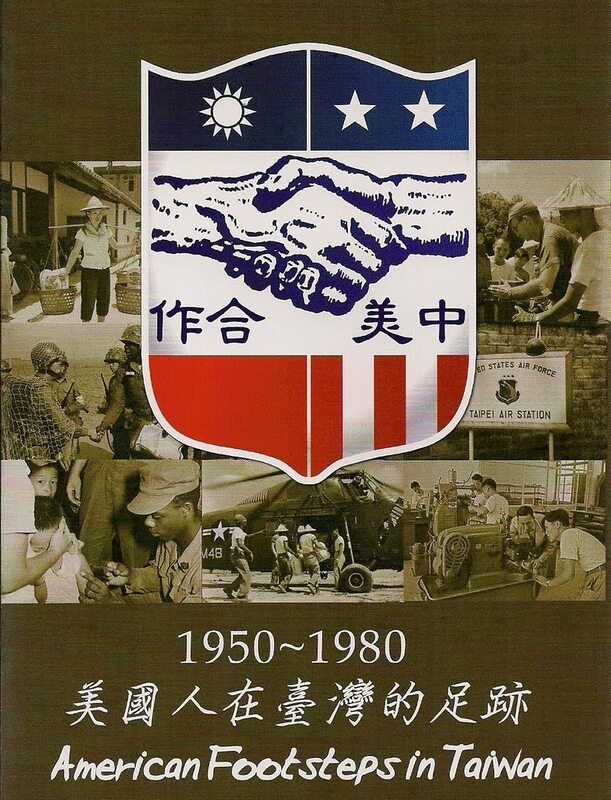 the unofficial document describing much of what went on in the US Air Force throughout Taiwan, from 1950 until 1969. If you'd like to read the documents, they are in this blog. Go to the search box on the right side of this blog and search for "history" All of the posts should appear. There are quite a few different posts and it will take some time to comb through them. From: History of the US Air Force in Taiwan 1956. 21 May 1956. 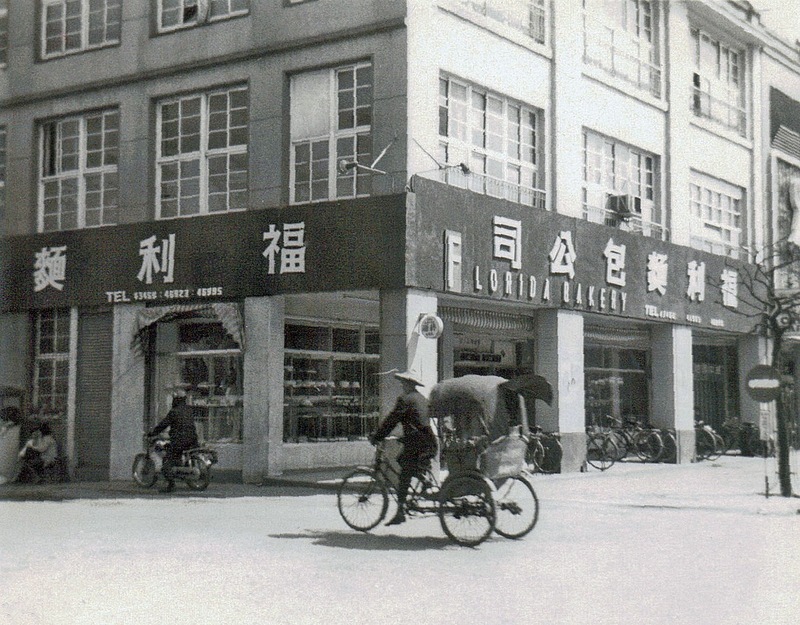 The first bread prepared on Taiwan was delivered by the “American” bakery in Taipei. This replaced bread shipments from Kadena AB, Okinawa. Photo courtesy Taipei Signal Army blog. This photo was taken some time before the color photo above. We've arrived on the corner of Chung Shan North Road and Min Quan road. Everyone remembers the King's Hotel. 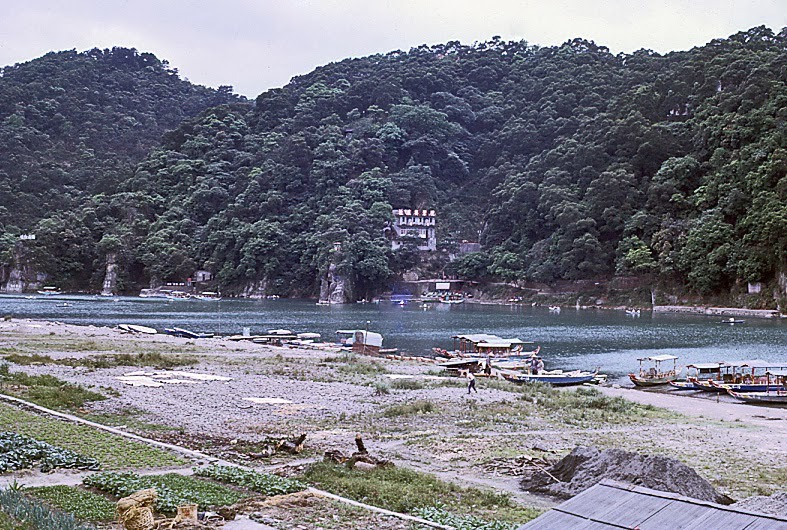 In our next post we'll make our way up to Shihmen on the north coast and visit John's Hostel and duty station. 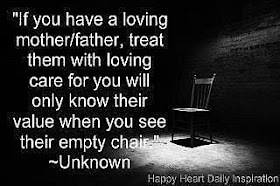 Leave your thoughts below in a Comment.